Miklós Boskovits (1935–2011), “Andrea di Bartolo/The Nativity of the Virgin/c. 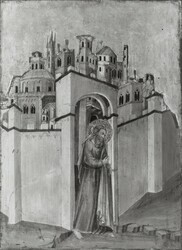 1400/1405,” Italian Paintings of the Thirteenth and Fourteenth Centuries, NGA Online Editions, https://purl.org/nga/collection/artobject/183 (accessed April 19, 2019). This painting presents the birth of the Virgin as a domestic tableau. Behind the parted red curtain of her bed, Mary’s mother, Anna, rests after giving birth. Her husband, Joachim, sits outside the bedchamber; his is no ordinary child, and he appears lost in thought, unaware of his companion. The infant Mary stands on sturdy legs supported and admired by two serving women, as another pours water from a pitcher so Anna can wash her hands. A fourth woman enters through the doorway, bringing a roasted chicken to the new mother. She looks out of the picture directly, drawing us into the scene. The emphasis on the human and the familiar—that chicken is almost in the center of the painting—made the Virgin and her family approachable to viewers and brought sacred events into the sphere of their own experience. 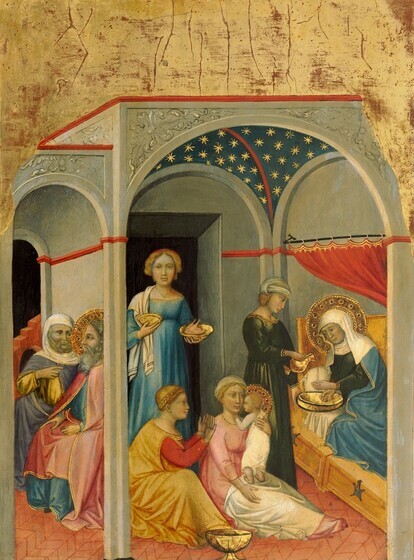 This and two other small paintings by Andrea di Bartolo at the National Gallery of Art, Joachim and Anna Giving Food to the Poor and Offerings to the Temple and The Presentation of the Virgin in the Temple, were all part of one altarpiece. They depict scenes from the childhood of the Virgin, and must have been joined originally by many other panels—now lost—illustrating episodes from Mary’s life. Because the surviving panels share vertical wood grain, scholars have theorized that they were probably all connected, one on top of another. We do not know what was featured on the center panel; it might have been an Annunciation, Mary’s coronation as Queen of Heaven, or another subject (see Reconstruction). On the typology of vita-icon in Tuscany, see Victor M. Schmidt, “Tipologie e funzioni della pittura senese su tavola,” in Duccio: Siena fra tradizione bizantina e mondo gotico, ed. Alessandro Bagnoli et al. (Cinisello Balsamo, Milan, 2003), 541 – ​544; Rita Sauer, “ ‘. . . so be ye holy in all manner of conversation’: The Vita Retable,” in Kult Bild: Das Altar- und Andachtsbild von Duccio bis Perugino (Petersberg, 2006), 131 – ​176. For vita-icons with horizontally arranged scenes, see Taddeo di Bartolo’s panel San Geminianus Enthroned and Eight Stories of His Legend, or Andrea di Bartolo’s panel with the Crucifixion at the center and eight scenes from the life of Christ and of saints to the sides, formerly in the Stoc­let collection in Brussels. Cf. Raimond van Marle, The Development of the Italian Schools of Painting, vol. 2, The Sienese School of the 14th Century (The Hague, 1924), fig. 354; Pierre Bautier, “I primitivi italiani della collezione Stoclet a Bruxelles,” Cronache d’arte 4 (1927): 315 and fig. 6. Taddeo di Bartolo’s San Geminianus dossal (see note 10 above) has been transferred to a modern panel support with a vertical wood grain and so cannot be adduced for comparison. He further notes that the incised profiles of the original frame moldings on our panels argue for a Venetian provenance. In Tuscany, engaged frames were applied before the panels were gessoed or gilt. In Venice, they were added afterward, and their profiles are often found inscribed on the picture surface as a guide to the painter. The narrative of the Pseudo-­Matthew was supplemented with other episodes by a German priest named Wernher in the mid-twelfth century. His Driv liet von der maget (Three Books on the Virgin) is the first source to mention the story of the division of Joachim’s worldly goods for charitable purposes; see Gertrud Schiller, Ikonographie der christlichen Kunst, 6 vols. (Gütersloh, 1966 – ​1990), 4, pt. 2: 54 – ​55; W. J. Hoffman, “Wernher,” in Marienlexikon, ed. Remigius Bäumer and Leo Scheffczyk, 6 vols. (St. Ottilien, 1994), 6:716 – ​717. In the panel at the Gallery, we see, to the left, Joachim distributing loaves of bread to the poor, while his wife is presiding over the delivery of sacks of grain to the temple, where a priest receives them. This episode would have been followed by the lost scene of the priest’s rejection of the offering of a sacrificial animal and the Expulsion from the Temple, the premise for Joachim’s Abandonment of the City, which is described in the painting now in Esztergom. This lost cycle on the façade of the Ospedale della Scala is now known only from descriptions in the sources. Various scholars have proposed the involvement in it not only of the Lorenzetti brothers but also of Simone Martini (Sienese, active from 1315; died 1344); cf. Daniela Gallavotti Cavallero, “Pietro, Ambrogio e Simone, 1335, e una questione di affreschi perduti,” Prospettiva 48 (1987): 69 – ​74, and for a recent summary of the status questionis, see Wolfgang Loseries, in Maestri senesi e toscani nel Lindenau – ​Museum di Altenburg, ed. Miklós Boskovits and Johannes Tripps (Siena, 2008), 130 n. 17. The scene represents the episode of the three-year-old Mary being taken by her parents to the temple; the child spontaneously ascends the flight of steps to the temple, where she would reside until the age of fourteen. By painting the temple at an angle to the picture plane, displaced to the right side of the composition, Andrea seems, however, more faithful to his father’s more dynamic and “modern” composition than to the Lorenzettian model. In manuscript expertises (some of them dated 1934), Giuseppe Fiocco, Raimond van Marle, Osvald Sirén, Wilhelm Suida, and Adolfo Venturi all proposed an attribution of the three panels to Bartolo di Fredi. According to the manuscript opinion of F. Mason Perkins, however, the panels were attributable not to Bartolo himself but to an “exceptionally close and as yet unidentified pupil.” See Fern Rusk Shapley, Catalogue of the Italian Paintings, 2 vols. (Washington, DC, 1979), 1:4, and copies of the expertises in NGA curatorial files. According to G. Fattorini, in La collezione Salini: Dipinti, sculture e oreficerie dei secoli XII, XIII, XIV e XV, ed. Luciano Bellosi, 2 vols. (Florence, 2009), 1:238, the painting was possibly decorated with the very same punches as the Washington stories of the Virgin. The miniatures of antiphonary H.1.7 now in the Biblioteca Comunale of Siena are dated c. 1400; cf. Giulietta Chelazzi Dini, in Il gotico a Siena: Miniature, pitture, oreficerie, oggetti d’arte (Florence, 1952), 320 – ​321; Gaudenz Freuler, “La miniatura senese degli anni 1370 – ​1420,” in La miniatura senese 1270 – ​1420, ed. Cristina De Benedictis (Milan, 2002), 182 – ​186. The illuminations of a missal, G.III.7 in the same library, are at least in part probably attributable to Andrea in a slightly earlier phase, as Chelazzi Dini proposed in Il gotico a Siena: Miniature, pitture, oreficerie, oggetti d’arte (Florence, 1982), 317 – ​318. The strong compositional simplification and charged color of these miniatures reveal significant affinities with the scenes from the life of the Virgin being discussed here, and thus seem to confirm that they belong to a relatively precocious phase in Andrea’s career. Apart from polyptych no. 220 of the Pinacoteca in Siena, generally considered a late work of Andrea, I refer to the polyptych in Sant’Angelo in Vado, now divided between the Pinacoteca di Brera in Milan and the Galleria Nazionale in Urbino, and the dispersed predella reconstructed around the Crucifixion no. 12.6 in the Metropolitan Museum of Art, New York. For these paintings, see Piero Torriti, La Pinacoteca Nazionale di Siena, vol. 1, I dipinti dal XII al XV secolo (Genoa, 1977), 207; Valentina Maderna, “Il polittico di Andrea di Bartolo a Brera,” in Il polittico di Andrea di Bartolo a Brera restaurato, ed. Valentina Maderna (Florence, 1986), 9 – ​15; Federico Zeri, in Federico Zeri and Elizabeth E. Gardner, Italian Paintings: Sienese and Central Italian Schools; A Catalogue of the Collection of the Metropolitan Museum of Art (New York, 1980), 1 – ​​2; and Miklós Boskovits and Serena Padovani, The Thyssen-­Bornemisza Collection: Early Italian Painting 1290 – ​​1470 (London, 1990), 16 – ​​21. In my discussion of this predella in 1990, I wrongly connected it with two lateral panels of paired saints from a dispersed triptych, now in a private collection. These panels, Saints Louis of Toulouse and John the Baptist and John the Evangelist and Francis, now seem to me relatively early works of the artist, probably datable to the first decade of the fifteenth century, whereas the predella I had placed in the period c. 1415 – ​​1420 ought to be closer in date to the latter end of this spectrum. Gold Backs: 1250 – ​1480 (Turin, 1996), 122, 124; Gabriele Fattorini, in La collezione Salini: Dipinti, sculture e oreficerie dei secoli XII, XIII, XIV e XV, ed. Luciano Bellosi, 2 vols. (Florence, 2009), 1:236 – ​249. The painting, cut on all sides, measures 25.5 × 21 cm. The fragment at first sight might also seem the companion panel of these in the Gallery, but its original size must have been slightly smaller than that of the Washington panels. This panel, along with NGA 1939.1.41 and 1939.1.43, are stated to have come from the collection of a contessa Giustiniani, Genoa; (Count Alessandro Contini-Bonacossi, Rome); sold July 1930 to the Samuel H. Kress Foundation, New York; gift 1939 to NGA. See the bill of sale described in note 2. No documented collection of the conti Giustiniani at Genoa seems to have existed, at least in the early years of the twentieth century. The works that Elisabeth Gardner ( A Bibliographical Repertory of Italian Private Collections, ed. Chiara Ceschi and Katharine Baetjer, 4 vols., Vicenza, 1998-2011: 2(2002):183) cites as formerly the property of the contessa Giustiniani almost all seem to have been purchased on the art market shortly before 1930, when Contini Bonacossi sold them to Samuel H. Kress. The contessa is thus more likely to have been a dealer, or agent, than a collector. See also Miklós Boskovits and David Alan Brown, Italian Paintings of the Fifteenth Century, National Gallery of Art Systematic Catalogue, Washington and New York, 2003: 616 n. 3. The painting is included on a bill of sale dated 15 July 1930 that included eight paintings from the Giustiniani collection (copy in NGA curatorial files). A photographic or digital image analysis method that visually records an object's ability to absorb or transmit x-rays. The differential absorption pattern is useful for examining an object's internal structure as well as for comparing the variation in pigment types. show three round marks along the bottom of The Presentation and The Nativity, which may be the sites of old holes from nails that attached a horizontal batten. A drawing executed on a ground before paint is applied., particularly in the draperies of the figures and the placement of the architectural forms. Incised lines were used, on the other hand, to delineate the main contours of the figures, of architectural details, and of the original frame, now lost, against the gold. National Gallery of Art. Book of Illustrations. Washington, 1941: 51 (repro. ), 236. Preliminary Catalogue of Paintings and Sculpture. National Gallery of Art, Washington, 1941: 3, no. 153. Book of Illustrations. National Gallery of Art, Washington, 1942: 242, repro. 53. Brandi, Cesare. Quattrocentisti senesi. Milan, 1949: 243, pl. 9. Ferguson, George. Signs and Symbols in Christian Art. 2nd ed. New York, 1955: pl. 21. Paintings and Sculpture from the Samuel H. Kress Collection. National Gallery of Art, Washington, 1959: 36, repro. Mojzer, Miklós. "Vier sienesische Quattrocento-Tafeln des Christlichen Museums zu Esztergom." Pantheon 22 (1964): 1, 2 (repro. ), 6 n. 5. Boskovits, Miklós, Miklós Mojzer, and András Mucsi. Das Christliche Museum von Esztergom (Gran). Budapest, 1965: 44. Boskovits, Miklós, Miklós Mojzer, András Mucsi, Alfréd Schiller, Elizabeth Hoch, and Susanna Horn. Christian Art in Hungary: Collections from the Esztergom Christian Museum. Budapest, 1965: 52. Summary Catalogue of European Paintings and Sculpture. National Gallery of Art, Washington, 1965: 7. Boskovits, Miklós. Early Italian Panel Paintings. Budapest, 1966: 40. Schiller, Gertrud. Ikonographie der christlichen Kunst. 6 vols. Gütersloh, 1966-1990: 4, pt. 2:64, 65, 71, 246, 316, fig. 520. Shapley, Fern Rusk. Paintings from the Samuel H. Kress Collection: Italian Schools, XIII-XV Century. London, 1966: 65-66, fig. 176. Berenson, Bernard. Italian Pictures of the Renaissance. Central Italian and North Italian Schools. 3 vols. London, 1968: 1:8. European Paintings and Sculpture, Illustrations. National Gallery of Art, Washington, 1968: 1, repro. Carli, Enzo. I pittori senesi. Siena, 1971: 138, fig. 123. Os, Hendrik W. van. "Andrea di Bartolo’s Assumption of the Virgin." Arts in Virginia 2 (1971): 4. Fredericksen, Burton B., and Federico Zeri. Census of Pre-Nineteenth Century Italian Paintings in North American Public Collections. Cambridge, Mass., 1972: 7, 300, 645. European Paintings: An Illustrated Summary Catalogue. National Gallery of Art, Washington, 1975: 12, repro. Mucsi, András. Katalog der Alten Gemäldegalerie des Christlichen Museums zu Esztergom. Budapest, 1975: 42. Shapley, Fern Rusk. Catalogue of the Italian Paintings. National Gallery of Art. 2 vols. Washington, 1979: 1:4-5; 2:pl. 3. Carli, Enzo. La pittura senese del Trecento. 1st ed. Milan, 1981: 238, fig. 279. Il gotico a Siena: miniature, pitture, oreficerie, oggetti d’arte. Exh. cat. Palazzo Pubblico, Siena. Florence, 1982: 313, 317. Kasten, Eberhard. "Andrea di Bartolo." In Allgemeines Künstlerlexikon: Die bildenden Künstler aller Zeiten und Völker. Edited by Günter Meissner. 3 vols. Leipzig, 1983-1990: 2(1986):974, 976. L’Art gothique siennois: enluminure, peinture, orfèvrerie, sculpture. Exh. cat. Musée du Petit Palais, Avignon. Florence, 1983: 280, 284. Walker, John. National Gallery of Art, Washington. Rev. ed. New York, 1984: 82, no. 38, color repro. European Paintings: An Illustrated Catalogue. National Gallery of Art, Washington, 1985: 18, repro. Kanter, Laurence B. "Giorgio di Andrea di Bartolo." Arte cristiana 74 (1986): 21-22, 24, repro. 26. Maderna, Valentina, ed. Il polittico di Andrea di Bartolo a Brera Restaurato. Exh. cat. Pinacoteca di Brera, Milan. Florence, 1986: 17. Gurrieri, Francesco, and Luciano Bellosi, eds. La Sede storica del Monte dei Paschi di Siena: vicende costruttive e opere d’arte. Florence, 1988: 276. Chelazzi Dini, Giulietta. "Andrea di Bartolo." In Enciclopedia dell’arte medievale. Edited by Istituto della Enciclopedia italiana. 12 vols. Rome, 1991-2002: 1(1991):595. Kasten, Eberhard. "Andrea di Bartolo." In Allgemeines Künstlerlexikon: Die bildenden Künstler aller Zeiten und Völker. Edited by Günter Meissner. 87+ vols. Munich and Leipzig, 1992+: 3(1992):512, 514. Lorentz, Philippe. "De Sienne a Strasbourg: posterité d’une composition d’Ambrogio Lorenzetti, la Nativité de la Vierge de l’Hôpital Santa Maria della Scala à Sienne." In Hommage à Michel Laclotte: Etudes sur la peinture du Moyen Age et de la Renaissance. Edited by Luciano Bellosi, Pierre Rosenberg, Cécile Scailliérz, and Dominique Thiébault. Milan and Paris, 1994: 125 (repro. ), 126, 127, 130-131 n. 45. Chelazzi Dini, Giulietta, Alessandro Angelini, and Bernardina Sani. Sienese Painting From Duccio to the Birth of the Baroque. New York, 1997: 200-201. Chelazzi Dini, Giulietta. "La cosidetta crisi della metà del Trecento (1348-1390)." In Pittura senese. Edited by Giulietta Chelazzi Dini, Alessandro Angelini and Bernardina Sani. 1st ed. Milan, 1997: 200. Frinta, Mojmír S. Punched Decoration on Late Medieval Panel and Miniature Painting. Prague, 1998: 69. Bellosi, Luciano, et al., eds. La collezione Salini: dipinti, sculture e oreficerie dei secoli XII, XIII, XIV e XV. 4 vols. Florence, 2009, 2015: 1(2009):238. Boskovits, Miklós. Italian Paintings of the Thirteenth and Fourteenth Centuries. The Systematic Catalogue of the National Gallery of Art. Washington, 2016: 14-25, color repro. No. 55.148; 46 × 34 cm. The painting, its provenance unknown, was purchased by Cardinal János Simor, perhaps in Rome, for the museum in Esztergom between 1867 and 1878; see Miklós Boskovits et al., Christian Art in Hungary: Collections from the Esztergom Christian Museum (Budapest, 1965), 52. Its original gold ground was evidently removed at an early date, and it, like the Washington panels, was regilded during a nineteenth-century restoration. On the role of Joachim in Italian cycles of the childhood of Mary, cf. Jacqueline Lafontaine-­Dosogne, Iconographie de l’enfance de la Vierge dans l’Empire byzantin et en Occident, 2 vols. (Bruxelles, 1964–1965), 2:154–159; Gertrud Schiller, Ikonographie der christlichen Kunst, 6 vols. (Gütersloh, 1966–1990), 4, pt. 2: 38–54. As an example we may cite the vita-icon, name piece of the Master of San Martino in the Museo Nazionale in Pisa, in which the main image at the center is flanked on either side by six superimposed stories from the life of the Virgin. See Enzo Carli, Il Museo di Pisa (Pisa, 1974), 41–43 and fig. 48. Cf. the retable of Bernat de Puig in the Museu Nacional d’Art de Cata­lunya, Barcelona, repro. in Josep Gudiol and Santiago Alcolea i Blanch, Pintura gótica catalana (Barcelona, 1986), fig. 57. As in the polyptych commissioned from Bartolo di Fredi for the church of San Francesco at Montalcino; cf. Gaudenz Freuler, Bartolo di Fredi Cini: Ein Beitrag zur sienesischen Malerei des 14. Jahrhunderts (Disentis, 1994), 188–221. The Annunciation is placed at the center of an illuminated page with scenes from the childhood of Mary, executed by the Bedford Master, in a Book of Hours in the Oesterreichisches Nationalbibliothek in Vienna, cod. 1855; Gertrud Schiller, Ikonographie der christlichen Kunst, 6 vols. (Gütersloh, 1966 – ​1990), 4, pt. 2: pl. 467. The scene of Pentecost occupies a central position in the cycle of frescoes by the young Bartolo di Fredi in the church of Sant’Agostino at San Gimignano. See Gaudenz Freuler, Bartolo di Fredi Cini: Ein Beitrag zur sienesischen Malerei des 14. Jahrhunderts (Disentis, 1994), 32 – ​45. On the structural characteristics of the predella in late medieval altarpieces in Tuscany, see Monika Cämmerer-­George, Die Rahmung der toskanischen Altarbilder im Trecento (Strasbourg, 1966), 93−94; Christoph Merzenich, Vom Schreinerwerk zum Gemälde: Florentiner Altarwerke der ersten Hälfte des Quattrocento (Berlin, 2001), 55. Cesare Brandi formulated this hypothesis, and various scholars accepted it, in Cesare Brandi, Quattrocentisti senesi (Milan, 1949), 243. Joanna Dunn of the National Gallery of Art conservation department tells me that, judging from the cracks lining up, it seems a “strong possibility” that The Nativity of the Virgin was placed above The Presentation of the Virgin in the Temple. However, the x-radiographs do not show the wood grain clearly enough to prove this. Taddeo di Bartolo’s San Geminianus dossal (see note 10 above) has been transferred to a modern panel support with a vertical wood grain and so cannot be adduced for comparison. 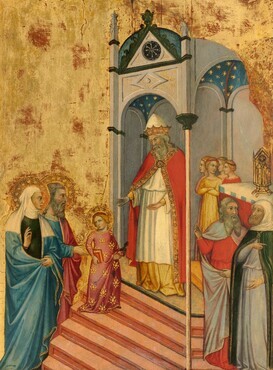 The scene frescoed by Bartolo in Sant’Agostino at San Gimignano was repeated with small variations by the same painter in the predella fragment, part of the altarpiece commissioned from Bartolo for the church of San Francesco at Montalcino and now in the local Museo Civico. See Gaudenz Freuler, Bartolo di Fredi Cini: Ein Beitrag zur sienesischen Malerei des 14. Jahrhunderts (Disentis, 1994), figs. 34, 37. The young Andrea probably collaborated in the execution of this part of the Montalcino altarpiece. Reproduced in Gaudenz Freuler, Bartolo di Fredi Cini: Ein Beitrag zur sienesischen Malerei des 14. Jahrhunderts (Disentis, 1994), fig. 27. This lost cycle on the façade of the Ospedale della Scala is now known only from descriptions in the sources. Various scholars have proposed the involvement in it not only of the Lorenzetti brothers but also of Simone Martini (Sienese, active from 1315; died 1344); cf. Daniela Gallavotti Cavallero, “Pietro, Ambrogio e Simone, 1335, e una questione di affreschi perduti,” Prospettiva 48 (1987): 69 – ​74, and for a recent summary of the status questionis, see Wolfgang Loseries, in Maestri senesi e toscani nel Lindenau – ​Museum di Altenburg, ed. Miklós Boskovits and Johannes Tripps (Siena, 2008), 130 n. 17. Roberto Longhi made the attribution to Andrea di Bartolo in an undated expertise most likely written in 1934, like the others cited in the previous note; see Fern Rusk Shapley, Catalogue of the Italian Paintings, 2 vols. (Washington, DC, 1979), 1:4. Bernard Berenson endorsed this proposal (in an autograph annotation written on the back of a photograph of The Nativity), though with the specification “in great part.” Copies in NGA curatorial files. The dating “c. 1400” already appeared in the entry relating to the three panels in the National Gallery of Art, Preliminary Catalogue of Paintings and Sculpture (Washington, DC, 1941), 3, and was confirmed in the various successive catalogs of the Gallery, as well as by Fern Rusk Shapley, Paintings from the Samuel H. Kress Collection: Italian Schools, xiii – ​xv Century (London, 1966), 65 – ​66; Enzo Carli, I pittori senesi (Siena, 1971), 138; Enzo Carli, La pittura senese del Trecento (Milan, 1981), 238; Giulietta Chelazzi Dini, in Il gotico a Siena: Miniature, pitture, oreficerie, oggetti d’arte (Florence, 1982), 317; Valentina Maderna, ed., Il polittico di Andrea di Bartolo a Brera restaurato (Florence, 1986), 17; and Philippe Lorentz, “De Sienne a Strasbourg: Posterité d’une composition d’Ambrogio Lorenzetti, la Nativité de la Vierge de l’Hôpital Santa Maria della Scala à Sienne,” in Hommage à Michel Laclotte: Etudes sur la peinture du Moyen Age et de la Renaissance (Paris, 1994), 125 repro., 126, 127, 130 – ​131 n. 45. Miklós Boskovits, Early Italian Panel Paintings (Budapest, 1966), 40; András Mucsi, Katalog der Alten Gemälde­galerie des Christlichen Museums zu Esztergom (Budapest, 1975), 42; Eberhard Kasten, “Andrea di Bartolo,” in Allgemeines Künstlerlexikon: Die bildenden Künstler aller Zeiten und Völker, ed. Günter Meißner (Munich, 1992), 3:512, 514, proposed, instead, a less specific date for the three panels in the first decade of the fifteenth century. Laurence B. Kanter, “Giorgio di Andrea di Bartolo,” Arte cristiana 74 (1986): 22. Corrado Fratini rejected this rather audacious attribution in Pinacoteca comunale di Città di Castello, vol. 1, Dipinti, Catalogo regionale dei beni culturali dell’Umbria, ed. Francesco Federico Mancini (Perugia, 1987), 143 – ​144; see also Elisabetta Avanzati, in La Sede storica del Monte dei Paschi di Siena: Vicende costruttive e opere d’arte, ed. Francesco Gurrieri and Luciano Bellosi (Florence, 1988), 276 – ​280; Michel Laclotte and Esther Moench, Peinture italienne: Musée du Petit Palais, Avignon (Paris, 2005), 56; and Andrea De Marchi, in Pinacoteca Nazionale di Bologna, catalogo generale, vol. 1, Dal Duecento a Francesco Francia, ed. Jadranka Bentini, Gian Piero Cammarota, and Daniela Scaglietti Kelescian (Venice, 2004), 183 – ​184. Enzo Carli, Il Museo di Pisa (Pisa, 1974), 61–62. Suggested dating: probably before 1400. Francesca Pasut, in Maestri senesi e toscani nel Lindenau–Museum di Altenburg, ed. Miklós Boskovits and Johannes Tripps (Siena, 2008), 104–106, with dating c. 1395–1400. No. JC Cat. 99; see Carl Brandon Strehlke, Italian Paintings, 1250 – ​1450, in the John G. Johnson Collection and the Philadelphia Museum of Art (Philadelphia, 2004), 37 – ​41. Suggested dating: c. 1394. Nn. O11.919 – ​O11.921. See Olga Pujmanová, Italienische Tafelbilder des Trecento in der Nationalgalerie Prag (Berlin, 1984), no. 20. Suggested dating: c. 1400. No. 133; see Piero Torriti, La Pinacoteca Nazionale di Siena, vol. 1, I dipinti dal xii al xv secolo (Genoa, 1977), 203, with dating to the early years of the fifteenth century. 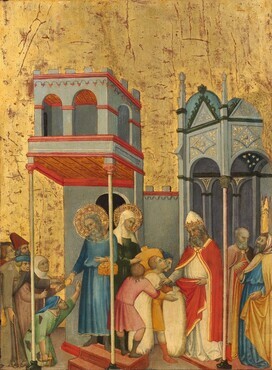 Alessandro Cecchi, in Il gotico a Siena: Miniature, pitture, oreficerie, oggetti d’arte (Florence, 1982), 328–331, with dating to c. 1400–1410. See Raimond van Marle, The Development of the Italian Schools of Painting, vol. 2, The Sienese School of the 14th Century (The Hague, 1924), 576, and Antonio Vannini, L’Osservanza di Siena: Guida artistica della chiesa e del convento di San Bernardino all’Osservanza (Siena, 2004), 40–41. Hendrik W. van Os, “Andrea di Bartolo’s Assumption of the Virgin,” Arts in Virginia 2 (1971): 5, dated the painting now in Richmond (no. 54.11.3; 230.2 × 85 cm) “in the seventies” of the fourteenth century. Gaudenz Freuler, “Andrea di Bartolo, Fra Tommaso d’Antonio Cafarini, and Sienese Dominicans in Venice,” The Art Bulletin 69 (1987): 584, pushed its date forward to the latter years of the century, given that Ser Palamedes, in whose memory the painting was commissioned, was still alive in 1394. Art historians in general, however, have continued to regard the panel as a youthful work of the artist. See Elisabetta Avanzati, in La Sede storica del Monte dei Paschi di Siena: Vicende costruttive e opere d’arte, ed. Francesco Gurrieri and Luciano Bellosi (Florence, 1988), 282; Carl Brandon Strehlke, Italian Paintings, 1250 – ​1450, in the John G. Johnson Collection and the Philadelphia Museum of Art (Philadelphia, 2004), 27. The present writer has long maintained (and still believes) that Andrea di Bartolo’s stories of Christ, divided between the museums of Toledo in Ohio, Bologna, and private collections, probably belong to the Richmond Assumption. It is generally recognized as a work of the artist’s full maturity; cf. Andrea De Marchi, in Pinacoteca Nazionale di Bologna, catalogo generale, vol. 1, Dal Duecento a Francesco Francia, ed. Jadranka Bentini, Gian Piero Cammarota, and Daniela Scaglietti Kelescian (Venice, 2004), 183 – ​184, with a suggested dating of c. 1420. The common origin of the dispersed predella and the Richmond panel is suggested both by their stylistic character and their size. The width of the panel with the Assumption (measuring 230.2 × 85 cm) matches that of the Toledo Crucifixion (50 × 84.3 cm) that would in origin have been placed below it, at the center of the predella. See Miklós Boskovits and Serena Padovani, The Thyssen-­Bornemisza Collection: Early Italian Painting 1290 – ​1470 (London, 1990), 21. The miniatures of antiphonary H.1.7 now in the Biblioteca Comunale of Siena are dated c. 1400; cf. Giulietta Chelazzi Dini, in Il gotico a Siena: Miniature, pitture, oreficerie, oggetti d’arte (Florence, 1952), 320 – ​321; Gaudenz Freuler, “La miniatura senese degli anni 1370 – ​1420,” in La miniatura senese 1270 – ​1420, ed. Cristina De Benedictis (Milan, 2002), 182 – ​186. The illuminations of a missal, G.III.7 in the same library, are at least in part probably attributable to Andrea in a slightly earlier phase, as Chelazzi Dini proposed in Il gotico a Siena: Miniature, pitture, oreficerie, oggetti d’arte (Florence, 1982), 317 – ​318. On the Tuscania polyptych, cf. Luisa Mortari, in La pittura viterbese dal xiv al xvi secolo: Catalogo delle opere, ed. Italo Faldi and Luisa Mortari (Viterbo, 1954), 29 – ​30, and Laurence B. Kanter, “Giorgio di Andrea di Bartolo,” Arte cristiana 74 (1986): 17 – ​24. Kanter’s proposed reconstruction of the altarpiece, and his addition to it of components now situated elsewhere, seems correct, but it is difficult to share his attribution of it to Giorgio d’Andrea or his dating to the 1420s. This date, formerly accepted also by the present writer, now seems to me too late and should, I believe, be modified to 1405 – ​1410; cf. Miklós Boskovits and Serena Padovani, The Thyssen-­Bornemisza Collection: Early Italian Painting 1290 – ​1470 (London, 1990), 21. Gabriele Fattorini came to similar conclusions concerning the date of the Tuscania polyptych in La collezione Salini: Dipinti, sculture e oreficerie dei secoli XII, XIII, XIV e XV, ed. Luciano Bellosi, 2 vols. (Florence, 2009), 1:242 – ​249. Laurence B. Kanter, “Giorgio di Andrea di Bartolo,” Arte cristiana 74 (1986): 22 – ​24. The Minneapolis fragment was deaccessioned, and its present whereabouts are unknown to me. For the fragment no. 63 in the Pinacoteca Nazionale in Siena, cf. Piero Torriti, La Pinacoteca Nazionale di Siena, vol. 1, I dipinti dal XII al XV secolo (Genoa, 1977), 205. The somewhat naive compositional device proposed by the painter in the Nativity of the central panel of the triptych in Siena, namely that of displacing sharply to the left the little tree in the background to avoid its branches being concealed by the cusped border of the frame, recalls the improbable displacement — ​​​for the same reason — ​​​of the dome to the left margin of the temple in Presentation of the Virgin in the Temple and Joachim and Anna Giving Food to the Poor and Offerings to the Temple in the National Gallery of Art. We may further recall as works exemplifying Andrea’s phase at the turn of the century a portable triptych in the Brooklyn Museum in New York, no. 34. 839; see Carl Brandon Strehlke, Italian Paintings, 1250 – ​1450, in the John G. Johnson Collection and the Philadelphia Museum of Art (Philadelphia, 2004), 41, and the little panels with saints, formerly belonging to the museums in Altenburg, Oslo, Oxford, and in private collections; see Francesca Pasut, in Maestri senesi e toscani nel Lindenau – ​Museum di Altenburg, ed. Miklós Boskovits and Johannes Tripps (Siena, 2008), 107 – ​111. The NGA scientific research department identified the wood using optical microscopy (see report dated September 15, 1988, in NGA conservation files). Infrared reflectography was performed using a Hamamatsu c/1000-03 Vidicon camera. Fern Rusk Shapley, Catalogue of the Italian Paintings, 2 vols. (Washington, DC, 1979), 1:4. Reproduced still unframed in Cesare Brandi, Quattrocentisti senesi (Milan, 1949), pl. 9; National Gallery of Art, Paintings and Sculpture from the Samuel H. Kress Collection (Washington, DC, 1959), 36. However, The Presentation and The Nativity are reproduced with their modern frame in George Ferguson, Signs and Symbols in Christian Art, 2nd ed. (New York, 1955), pl. 21.